Behind the crooked-timbered rose-tinted façade of the Crooked House, in the picture postcard town of Lavenham, Suffolk, you’ll find exactly the kind of charming, old-fashioned tea shop of your dreams. Except this is no dream, this is Munning’s Tea Room, run by the talented Mrs Everyl Madell. Back in medieval days of yore, Lavenham was one of England’s wealthiest wool towns, so called due its huge success in the wool and weaving trades of the day. Today’s Lavenham is remarkably well-preserved and picturesque, with dozens of wonderful timber-framed buildings, quaint old cottages and the highest village church tower in the land. During the Second World War, Lavenham’s Guildhall served as the welcome club for hundreds of American troops stationed nearby. The historic walls of the Airman’s Bar at The Swan Hotel are still covered with handwritten messages, medals and mementoes of American and British airmen, like the Boot Record, a list of men in uniform able to down three and a half pints of ale from a glass boot in record time. Over on the High Street, the timbers of the Crooked House have warped over time causing its upper floors to look crooked. It’s even said to be the inspiration for the eponymous nursery rhyme. Inside, Mrs Madell offers a tasty range of cakes, pastries and scones, with everything freshly baked in her kitchen and, whenever possible, from local organic ingredients. Her Full Afternoon Tea is the real deal: generously- filled fresh sandwiches like Suffolk ham and mustard or cheddar cheese and red onion chutney, followed by Mrs Madell’s acclaimed scones, voluptuous pots of clotted cream and fruit conserve, an enormous piece of cake and plenty of tea. For a change, try her Fat Rascals, Frangipane or traditional tea loaf. Before leaving, be sure to take a short and crooked climb up the crooked stairs to the dizzying crooked heights of the Crooked House Art Gallery, and enjoy a post-tea browse through its tempting selection of antiques, prints, cards and giftware. Article by Judith Schrut. Email Judith. We surely won’t be either the first or last guests to remark that Afternoon Tea at Shangri-La Hotel’s Ting Lounge, on the 35th floor of London’s tallest building, takes tea-time to new heights. With its unsurpassed views of London’s stunning skyline above and riverside below through floor-to-ceiling windows, Ting is actually a Tale of two Teas. First, there’s a Classic Afternoon Tea, a perfectly lovely, traditional affair of finger sandwiches, house-made pastries, fruity scones heaped with clotted cream and strawberry jam and a curated selection of teas. For those seeking an extra layer of luxury, a glass or two of fine Champagne is an option. But what makes tea at Ting really special is its alternative Asian-inspired Afternoon Tea. Here’s your chance to sample savouries like spiced crab wrap, Banh Mi chicken and steamed prawn dim sum, and sweet things like scones with yuzu and orange marmalade, Thai Pandan custard and Malaysian layer cake. These tantalising treats are accompanied by a choice of unusual brews, like an intensely flowery and spicy Formosa Oolong, White Tea Snow Buds, smoky Keemun and Pu’erh, an earthy black tea double fermented and buried underground for two years. As you’d expect, tea-time at Ting is a comfortable, relaxing and unrushed affair, with welcoming service from an international staff. As the late afternoon sun sets over the River Thames below, you’ll be ready to set off home with your exquisite box of tea leftovers. Or, you may consider extending the high-glamour time with a cocktail on level 52’s Gong Lounge, a visit to the luxurious Ladies Powder Room with its scented, heat controlled toilets and unrivalled range of gadget chargers, a dip in the hotel’s sky pool or an overnight Shangri-La splurge. It’s no secret that afternoon tea is top of the list for visitors to Britain and an immensely enjoyable treat for the rest of us. And we Americans have a particularly soft spot for the tradition, and are quick to learn to use a tea strainer, put milk in our brew and deftly layer those tender scones with clotted cream and jam. With an ever-growing list of top hotels, restaurants and cafés offering their versions of afternoon tea, the competition for the annual Afternoon Tea Awards, the Oscars of the tea world, is a stiff one. Proud winner of this year’s Family Friendliest Tea is Grosvenor House Hotel’s wonderful Park Room. There is almost nothing more delightful than a late summer afternoon’s stroll through London’s Mayfair, with its historic streets, charming mews, elegant arcades, past gracious Grosvenor Square with its clear views of the US Embassy’s iconic golden eagle, as we approach our goal: a luxurious afternoon tea in the Park Room. The Park Room has recently been re-designed in a refreshing country house style. Details like peacock carpets, crystal butterfly lights, enormous fresh floral displays and plush green sofas overlooking Hyde Park all help to create an oasis of peace, calm and all things botanical. The Park Room boasts an innovative, The gracious Deanna, Park Room Grosvenor House Hotel seasonally-changing tea menu created by an international team of chefs. Anna’s Afternoon Tea gives guests a chance to sample the very best of British traditional tea treats: delicate finger sandwiches followed by a second course of large open ones, pastries like strawberry and cream choux or black cherry and custard with shortbread, lavish helpings of clotted cream and handmade preserves along with reputedly the best scones in London, (complementing the hotel’s JW Steakhouse nearby, which serves up the world’s best American cheesecake outside the USA).Tea-timers have the very challenging task of selecting their fresh brew or infusion from a beautifully described list of Newby teas, blends like English Breakfast, Fujian Oolong, Jasmine Pearls and Silver Needle. The award-winning Park Room Children’s Menu is a mix of art and joy, starring the imaginative Grover’s Children Tea.Your junior tea- timers will lap up goodies like double chocolate Brownie cornets, fruit skewers with yoghurt and coulis and miniature Knickerbocker Glories,* child-friendly sandwiches, and a cuddly present for little ones to take home. The list of special children’s tea blends includes Apple Strudel, Tropical Delight and Rooibos Tiramisu. Our advice? Just say,Yes please. *for the uninitiated, a Knickerbocker Glory is a quintessential British ice cream sundae, served in a tall glass with alternating layers of crunch, cream, fruit and syrup with a cherry on top, as featured in the Harry Potter books. Once upon a time, every high street in England had its tea shop. While sadly that’s no longer true, tea-time tradition is still very much alive and thriving in towns and villages across the UK. When Linda Rogers was five, her father Ronald bought her a Victorian glass photo slide for one penny. Enchanted by the pictured lady’s clothing and surroundings, little girl Linda wondered who the lady was and what her life was like. From that day on, she’s nurtured a lifelong love and fascination for vintage everything. Today, tea room Vintage LindyLou, which Linda runs with husband Brian and a close and dedicated team of bakers in a secret corner of Crayford, South-East London, surrounded by water gardens and reed beds, is the successful embodiment of that love as well as a chunk of living history. And a big success it certainly has been, fully booked daily with customers aged 2 to 102. They’re here not just for the freshly-prepared, delicious and affordable homemade cakes, sandwiches and scones, but also for the warm atmosphere and an environment where customers are encouraged to share memories and memorabilia, to touch, talk, explore and add their own old photos, postcards, tea-ware and trinkets to LindyLou’s displays, albums and old-fashioned memory boxes. Every nook and cranny of the tea room is filled with nostalgia. Here you can listen to comforting and familiar music from the 1930s & ‘40s, read original newspapers, books and magazines donated by customers and reminisce in the remembrance garden. The purposely mismatched tableware and china are not a gimmick, says Linda, but a chance to admire the beauty in each separate piece. There’s child-size china and a special menu for younger visitors and a ‘Cozy Corner,’ where you can sip and nip on comfy sofas covered in crocheted cushions and throws. The tea room also hosts special events, like cake-tastings, a Father Christmas breakfast, charity fundraisers and jazz afternoon tea dances. Pride of display in the Cozy Corner is a stylish knee-length crepe dress, lovingly hand sewn and painted with orchids by Linda’s newly- married mum Bianca. She wore it one day in 1947, when she boarded a train arranged by the Red Cross and forever left a life and family in post-war Italy to meet her English bridegroom at Paddington Station. Joy, calm, music, nostalgia, scrumptious cakes, comforting cuppas and the feeling of being amongst old friends: we think today’s world could do with a whole lot more LindyLou’s. American expat and Anglophile Henry James famously quipped, “there are few hours in life more agreeable than the hour dedicated to the ceremony known as afternoon tea”. But for a long time tea was a drink only the very rich could afford. Absurdly high tea taxes– peaking at 119% in the late eighteenth century – kept the humble tea leaf out of reach for the average Brit for many more years and led to the profitable business of tea smuggling. Once the price of tea finally plummeted, it swiftly replaced ale and gin as the drink of the masses. It’s been the UK’s Number One beverage ever since. One late afternoon in 1840, or so the legend goes, in that languid lull between lunch and dinner, a desperate Anne, 7th Duchess of Bedford, called for a pick-me-up pot of tea and a light snack to stop“that sinking feeling”....and the venerable tradition of Afternoon Tea was born. Sitting in the open air, ancient walled courtyard of the Old Parsonage Hotel sipping fresh brewed leaf tea from bone china cups and nibbling dainty raspberry tarts, you could easily imagine you are in the heart of a rural Cotswold village instead of a cobblestone’s throw away from the bustling centre of modern Oxford. Only envious glances of upper deck bus passengers taking a bird’s eye view over the wall as they pass by might steer your attention from a truly magnificent afternoon tea. Ordering both the traditional Very High Tea and the Very Savoury Tea menus results in a veritable feast, and the best way to try everything the Old Parsonage has to offer. For savouries, think rabbit Scotch Egg, anchovy- rich Gentleman’s Relish, potted shrimp and toasted sourdough soldiers, while the Very High Tea might include Bakewell Tart, choux pastry with coffee cream and rhubarb and custard macaroons. Both menus come with excellent sandwiches and wonderful scones– cheese scones for the Very Savoury Tea and fruit scones for the Very High Tea, all made fresh daily in the hotel’s kitchen, and no one minds whether you put the jam or clotted cream on first. But beware: expect lethally generous portions of both. To help those sweets and savouries go down, the Old Parsonage offers a solid choice of fine teas, like the bright and balanced Old Parsonage Blend, classic Earl Grey, deep, smooth, second flush Darjeeling and a rich, nutty wild Rooibos. 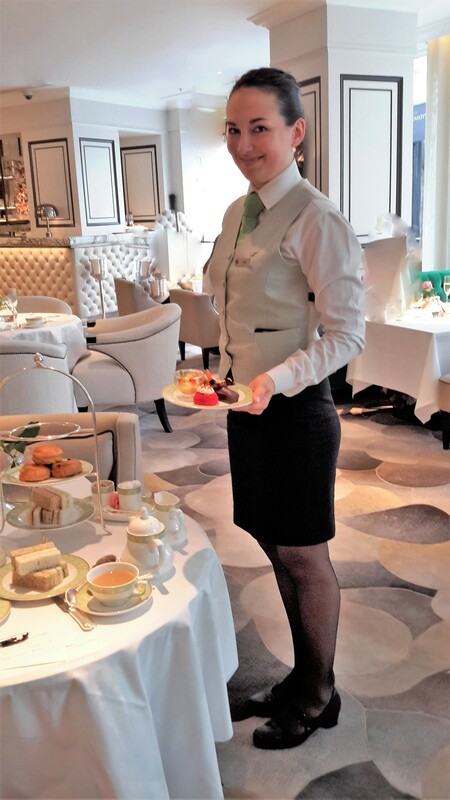 Excellent service from the genuine and gracious Natalya, and everyone else we meet on the hotel’s tea-team, plays a big part in making tea- time at the Old Parsonage the unforgettable, come-back-soon experience that it is. During our visit we also had the pleasure of tea-timing next to a large, friendly party of University of Nebraska students, on a summer course at an Oxford college and enjoying their first ever British tea-time with obvious enthusiasm. We thank them for letting us share their cheery photograph with our readers. Should you choose to take tea inside– a cozy choice for upcoming autumn afternoons– you’ll be greeted by a roaring log fire and enveloped in soft lighting, stylish décor, comfy seating and wonderful portraits from hotel owner Jeremy Mogford’s private collection. If you can’t get a reservation for tea at the Old Parsonage, try its nearby sister, Quod at the Old Bank Hotel, under the same ownership and with another uniquely Oxford tea experience. If you are minded to stay overnight so you can enjoy the Oxford magic a little longer, both the Old Parsonage and the Old Bank Hotel have comfortable, award-winning accommodation. That will give you plenty of chance to round off that perfect afternoon with a visit to Alice’s Old Sheep Shop, a punt on the Cherwell River and a sunset pint of beer at the historic Victoria Arms.